Compost Mixer 230 composter - winning design. Great composter design makes life easier! The KETER Compost Mixer 230 is a new design concept which helps you to convert organic garden and household waste into compost for fertiliser quickly. The outstanding design feature is the geared turning handle which allows the drum in which the composting material is held to be turned effortlessly. The Compost Mixer is manufactured from injection moulded polypropylene which provides a rigid and strong structure. The locking latch prevents the door from opening while the drum is being rotated and the adjustable air vents provide access for the oxygen which is essential for effective decomposition. Aerobic composting (that is, composting in which oxygen is readily available) produces usable material for the garden in half the time taken when using a traditional compost heap. Composting is becoming much more widely used as people realise the benefits associated with it. Not only does it save space in conventional waste disposal landfill facilities, but it also provides a nutritious supplement for the garden and reduces the need to use commercial fertilisers to build up soil quality in the garden. Many areas in Australia have very poor soil quality, making it difficult to grow and maintain plants other than local indigenous species. The addition of good quality compost not only provides nutrients for a wide range of plants but also assists with retention of water and reduces its usage. The KETER Compost Mixer 230 is currently available on special at Landera, and we are offering free delivery Australia wide. 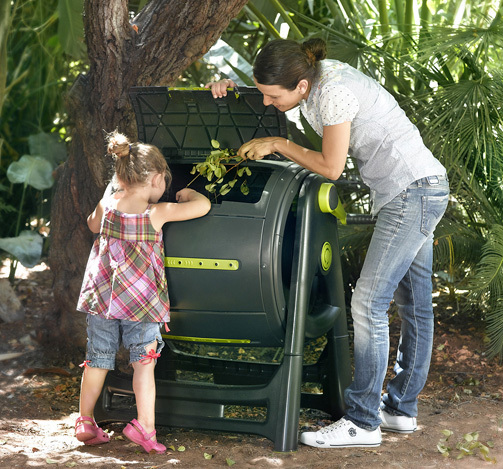 Check this great product out at http://landera.com.au/composters/keter-compost-tumbler-230-litre.